Gastritis refers to a condition that involves inflammation in the tissues lining your stomach. This condition may occur for a variety of reasons and can cause various symptoms. Antacids are a common medication for relieving gastritis. Although some antacids contain calcium, many antacid medications include a combination of magnesium and aluminum. 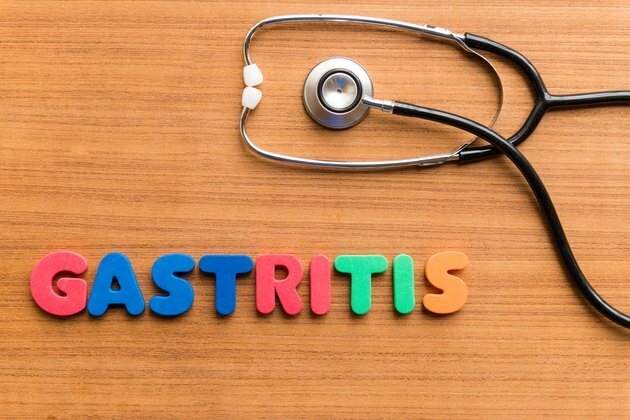 Gastritis is a common disorder that most people experience at some point in their lives. Symptoms of gastritis occur when certain substances or conditions irritate the stomach. The more prevalent causes of stomach irritation include consuming spicy foods, extended use of nonsteroidal anti-inflammatory drugs, bacterial infections, stress, drinking too much alcohol and smoking. Gastritis can cause stomach pain, nausea, belching and vomiting. You may experience a loss of appetite, belching and a sensation of abdominal fullness. If the irritation causes bleeding within your stomach, you may notice blood in your vomit or stool. The treatment for gastritis generally involves antacids or other medications, as well as avoidance of cigarettes and certain foods that cause irritation. Magnesium is an important nutrient your body needs to promote enzyme activation. Magnesium helps produce energy and supports the health of your muscles, kidneys, teeth and bones. Certain foods, such as leafy green vegetables, nuts and whole grains, provide rich sources of magnesium. The recommended amount of magnesium for most adults is between 270 and 400 milligrams daily. Although mineral supplements may help you meet your daily requirements, the magnesium in nutritional supplements is not recommended for treating gastritis. Antacids help treat gastritis by neutralizing the stomach acid. Antacid medications that contain magnesium usually contain the magnesium hydroxide form of this mineral, although some may contain magnesium carbonate or magnesium trisilicate. By themselves, these magnesium salts tend to upset your normal bowel function, causing both diarrhea and constipation. Antacid medications usually combine aluminum with the magnesium salts to help reduce this side effect. Tell your doctor about chronic or severe symptoms of gastritis, especially if over-the-counter antacid medications fail to help. Antacids that contain magnesium may cause muscle weakness and unusual tiredness. Avoid taking these types of antacids for more than two weeks, without your doctor's recommendation. Taking large amounts of antacid medications may increase your risk of developing osteoporosis, although this side effect is due to the aluminum they contain, rather than the magnesium.